Cherries are in season at the moment and Nisha is finding out all sorts of delicious ways to use them. 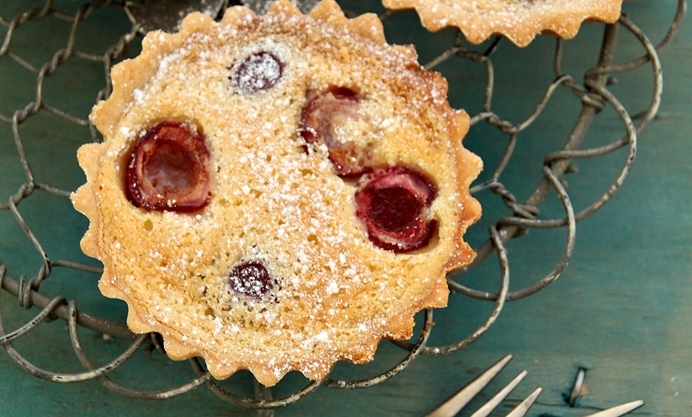 She’s chosen pretty, fresh and summery cherry clafoutis tartlets to share with us. Just the other day I was at a farmers market and stumbled upon some gorgeous cherries. I tasted a few and they were the sweetest and juiciest I’d tried so far this season. I bought a pack and resisting the urge to eat them, I made my way home, all the while brainstorming on what to make with them…something summery, something fresh. Tarts! it had to be tarts! but with a twist. Eric Lanlard’s cherry clafoutis tarts came to my rescue and they were a good choice. The tarts are pretty easy to make and you can prepare the base and filling a day or two ahead and put them together just before serving. This makes them perfect for those summer parties where you are busy with a 101 other things. I like them chilled, but feel free to devour them right out of the oven, still warm and gooey. Notes: You can of course use store bought short crust pastry for the base, or pre-made tart shells. This would make the job much easier. Make the filling while the tarts are blind baking and you can finish off the whole process much quicker. Or if you don’t want to do it all on the same day, make the tart shells a day or two before and store in an air tight container in the refrigerator. 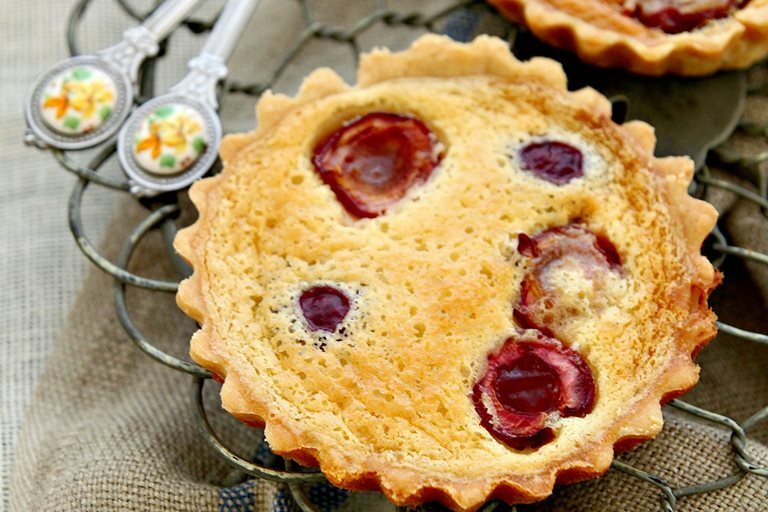 These tarts are not that sweet, so if you want them sweeter, serve with some stewed cherries or even ice cream.